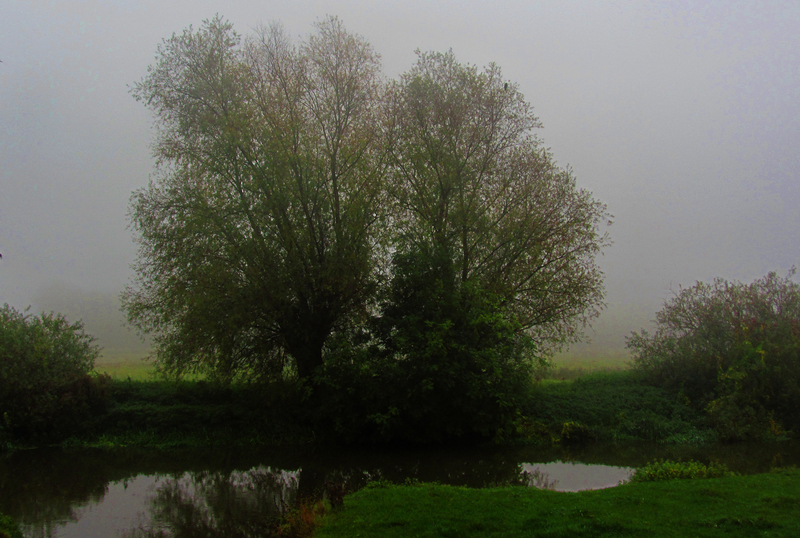 Granchester Meadows – a grey and cheerless dusk which Hardy would have appreciated. It is cooler now and the meadows have lost the smouldering Tuscan gleam they had last week. As if to reinforce the changed mood the farmers have been around and mowed flat the long grasses and the dry thistles that baffled even the tough lips of the Redpoll herd. No doubt this will lead to fresher and sweeter leaves to eat for the cattle as the summer days shorten to Autumn. For the moment however, it is a somewhat dreary sight. Last night at dusk there was a grey wash over the sky as I walked out into the meadows. It was one of those summer evenings which are nonchalantly non-descript – the air was warm and thick with the sweet peppery smell of newly mowed hay, and a few a slightly darker rags of cloud banded the uniform grey above. I wandered down to the river – silent except for the occasional delicious plop of a fish briefly sampling the air then deciding there was nothing of interest and descending back to the depths. A moorhen shrieked somewhere in the far distance. In the other direction towards the village the occasional flair of laughter from of a courting couple, otherwise all the revellers departed. I stopped for a moment at one of my favourite spots where the path, close to the river, plunges into a hedge and goes over a small wooden bridge. Here there is a dark space of cattle-scumbled earth underneath the hawthorn bushes and the shadow-grey willows. The word tenebrous might have been coined for such a space on such an evening at this. It is a Thomas Hardy kind of word, and this is a good evening to think of his poetry. To think of how his lovelorn victims of fate are melded with the landscape way in which we cannot be. To be born and to toil, to get sick and worn out in a landscape and yet to see its beauty. It was his art to create characters of whom these qualities would be believable. There are lilies in the river but the leaves are disheveled and blotched and mostly underwater. Tight yellow buds emerge here and there like stars just above the water, but I do not think they are going to come to anything. I hope that those lovers will have happy lives. There are so many bright and beautiful and talented people here in Cambridge – so many pressures to succeed so much that could go wrong. Although our growing in the grain of the land has gone, of course the basic human hopes and fears remain. We have lost that background of diurnal completeness, both its harshness and its dignity; but surely now it is easier to make a new start and repair your mistakes in a way that Jude could not. I would like to think so anyway. And look, there is a family of swans with five teenage goslings clustering around the parents. They seem in the absence of watchers to have abandoned their customary starched grace. These are swans off-duty, they paddle here and there, with their offspring, in the companionable silence that Yeats observed. The goslings make small, sharp ‘cleeping’ noises – calling to each other and their parents, as if they were still too young to be more than a stones-throw from mum and dad. Well, they must soon burst into the responsibility of all that white finery. I wonder if they will stay close or go far. It would be good to have five more swans on this stretch of the river. I wish them well, then turn for home through the soft grey dusk.